GLSurfaceView is a good base for building an application that uses OpenGL ES for part or all of its rendering. A 2D or 3D action game would be a good candidate, as would a 2D or 3D data visualization application such as Google Maps StreetView. This program doesn't do much: it clears the screen to black on every frame. But it is a complete OpenGL application, that correctly implements the Android activity life-cycle. It pauses rendering when the activity is paused, and resumes it when the activity is resumed. You could use this application as the basis for non-interactive demonstration programs. Just add more OpenGL calls to the ClearRenderer.onDrawFrame method. Notice that you don't even need to subclass the GLSurfaceView view. The onSurfaceCreated() method is called at the start of rendering, and whenever the OpenGL ES drawing context has to be recreated. (The drawing context is typically lost and recreated when the activity is paused and resumed.) OnSurfaceCreated() is a good place to create long-lived OpenGL resources like textures. The onSurfaceChanged() method is called when the surface changes size. 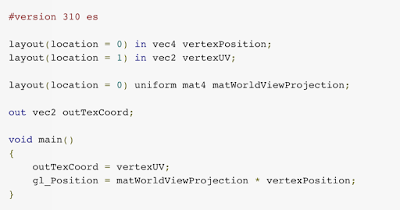 It's a good place to set your OpenGL viewport. You may also want to set your camera here, if it's a fixed camera that doesn't move around the scene. The onDrawFrame() method is called every frame, and is responsible for drawing the scene. You would typically start by calling glClear to clear the framebuffer, followed by other OpenGL ES calls to draw the current scene. This application clears the screen every frame. When you tap on the screen, it sets the clear color based on the (x,y) coordinates of your touch event. Note the use of queueEvent() in ClearGLSurfaceView.onTouchEvent(). The queueEvent() method is used to safely communicate between the UI thread and the rendering thread. If you prefer you can use some other Java cross-thread communication technique, such as synchronized methods on the Renderer class itself. But queueing events is often the simplest way of dealing with cross-thread communication. Touch Rotate - shows how to rotate a 3D object in response to user input. Choose the config with the fewest number of bits per pixel that has at least as many bits-per-channel as specified in the constructor. Allow total control over choosing a configuration. You pass in your own implementation of EGLConfigChooser, which gets to inspect the device's capabilities and choose a configuration. Most 3D applications, such as games or simulations, are continuously animated. But some 3D applications are more reactive: they wait passively until the user does something, and then react to it. For those types of applications, the default GLSurfaceView behavior of continuously redrawing the screen is a waste of time. If you are developing a reactive application, you can call GLSurfaceView.setRenderMode(RENDERMODE_WHEN_DIRTY), which turns off the continuous animation. Then you call GLSurfaceView.requestRender() whenever you want to re-render.